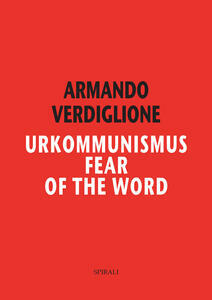 The Urkommunismus (the ideal place, the common place, the utopia, the pure place of origin) presides over every mysterious, therefore political, penal, social, financial, institutional, corporate doctrine, and dictates its canons, formulas, algorithms. It is the reference of every bureaucracy in its sacrificial, penal ceremonial. On the principle of nothingness, every regime unravels the fear of the word, to confiscate life. Ideally and really. Both “to the East” and “to the West”. In this book the analysis and reading are performed of the writings called “founding”, which mark our age, weighing down, in its models and its offices. The result is the text of the word, as well as the absolute novelty. And here we also discuss the letters of Aldo Moro, the letters of the Red Brigades, the writings of Paul VI, of “Clean Hands”, the European and Italian legislation, the writings of Cardinal Carlo Borromeo, of Giordano Bruno, of Eckhart, of Dante Alighieri, the Rigveda, the Bhagavad Gita, the Upanishad, the Avesta, the I Ching, Lao Tzu and Tao Te Ching, Lie Zi, Chuang-Tzu, the Bible, Buddha, the Qur’an, Antigone, Medea, the classics of tragedy, the classics of epics, of lyrics, of philosophy, of science, of mathematical logic, Confucius, Mencius, Ma gcig, the Sixth Dalai Lama, Mao, Khomeini, Gandhi, Narendra Modi, Xi Jinping.